Hello and Welcome to FabricFotos.net ! Thankyou for visiting to learn more about me. I have two great loves... Creative Quilting and American Indian Culture. I am a registered member of the Choctaw Tribe of Oklahoma. My Father was Choctaw, my Mother was White. I have 5 children, 14 grandchildren, and 3 great grandchildren. I have displayed at various quilt shows, (Houston, TX and Paducah, KY). I have been featured in quilting publications, Creative Quilting and four of House of White Birches. I have been featured in many quilting magazines as a source for photos on fabric. 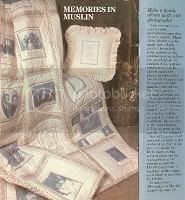 I feel that my first Memory Quilt that appeared in the September, 1987 issue of Creative Quilting Magazine was the beginning of the "memory quilt craze" (self imposed). For years I had a retail business, Fabric Fotos, that prompted me to start a manufacturing business I called "Bulls Country", and then I applied for and was issued a Patent (#4,724,468 issued February, 1988 - now expired) for the process I developed in my manufacturing business, with 6 employees. With my manufacturing business, I had seven Trade Mart Representatives: Dallas, Denver, Atlanta, Minneapolis, New York, Los Angeles, and San Francisco. Me in the retail shop of my manufacturing business. Memory Quilt that I made for my husband. 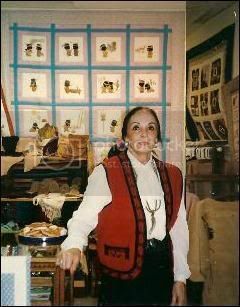 I was Director of the American Indian Cultural Center in Amarillo, Texas for 6 years. I started a program there for Indian Women to learn to quilt. We sold them on eBay, which launched my journey on eBay. You'll find some of my work in my store and I truly hope that you love it as much as I love creating it.